Very simple to make.. just use a lump of sandstone for the base, the flat top and bottom were formed simply by rubbing against another lump of sandstone making each contacting surface flat. It's best to observe the "stratigraphy"/planes of material in the stone and keeping them horizontal otherwise the fuel tends to leach into the stone to much rather than being held and usable. 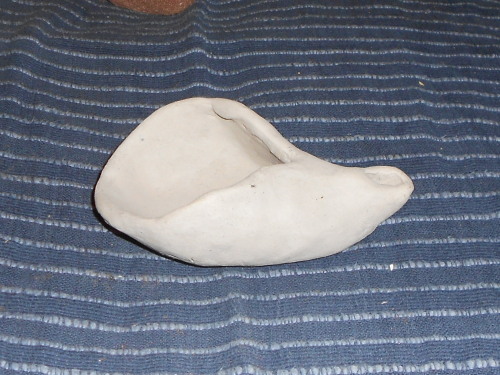 A depression/bowl shape is made in the middle (to hold fuel and the wick etc) by grinding/carving with a broken pebble which works very quickly. 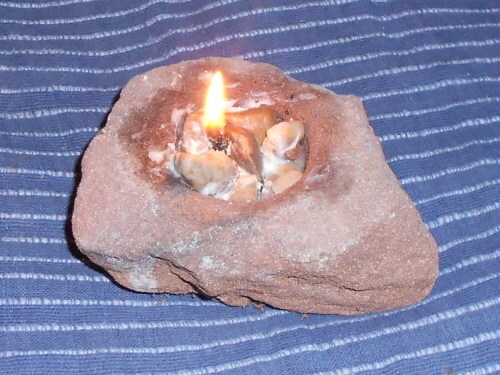 Then pebbles are placed inside to help the wick stand up, and they hold heat and keep solid fuel like lard from setting and not reaching the wick. Then i coat stones in lard, butter, oil, bear fat etc etc. The wick in this is a thin slice of Fomes Fomentarius/Tinderhoof, a slice of rotten wood from inside a dying tree works excellently too, and i think i have used slices of birch polypore too. Be sure to get some fuel on the wick before you light it... and obviously a longer wick makes for a bigger flame. Tjhey work a treat and take all of ten minutes to make... i've recently seen folk do these with a Birch Polypore as the base too, though carving the bowl would be a major PITA without a metal knife. A couple of years ago i made a clay lamp too, though it's only air dried (rather than fired in a kiln, i may try to paleo-fire it at some point) and it's never had fuel in it and been used. Another one to my list when this job is over. You really have developed some pretty amazing all round skills. I'm absolutely gobsmacked by the depth of knowledge in all areas, you really need to start a business selling this stuff. Cheers dude, i'm kinda working on it - i'm probably gonna hit a craft fair or two after the summer when i've finished a few more sticks and spoons at the very least and then hopefully reinvest in some more tools and materials to speed up my processes, which are not as fast as i'd like. Some life/living changes over the next year or so could hopefully pay off too "when the stars are right" lol and then maybe i can lead some group sessions and experience days. » Lamps on your Burrells ?